It was exactly eighteen years ago that I visited Italy for the first time. The Blond and I got married in early September, and a few days later landed in Rome for our three-week honeymoon.We rented a car and started driving north, mostly stopping in small towns and villages off the beaten path, but also doing the touristy thing, visiting museums, famous piazzas and fountains (Fonte Gaia in Siena!). Oh, and eating. There was lots and lots of eating. Our honeymoon scrapbook (you can see bits and pieces above) is full of postcards, photos we took, cards with names of restaurants we loved, and cats. We missed our cat very much (we only had one back then, the unforgettable Bella, whom my sister was babysitting while we were gone), and apparently lavished affection on every random cat (and dog) we happened to see. Some things never change. Here's something else that has stayed the same: the love of scent. Perfume and other smells. Italy is full of delectable scents (I'm not talking about the consequences of the sanitary workers strike in Rome that coincided with the last three days of our honeymoon), something we've experienced in every subsequent visit. These memories are as strong today as they were back in 1996. I packed two bottles with me. One was Panthere de Cartier, which I also wore on my wedding day. The big floriental bloomed around me wherever we went. I'm not sure I even bothered with the other one, a mini of Annick Goutal's Eau d'Hadrien. I love Hadrien, and in theory it's perfect for Italy, I just wan't feeling it. The husband traveled a lot lighter, and had yet to discover his passion for scent. But he did pack a mini bottle of the original Lacoste, and applied some every evening before we went out for dinner. Dinners were fun. We were still five years away from becoming vegetarians, but most of what we ate was fresh pasta and veggies. The smells of just-grated Parmigiano Reggiano, Pecorino Romano and Pecorino Toscano were everywhere. Smoky eggplants, fried seafood, crusty bread dipped in divine olive oil, many versions of torta della nonna made by various hosts at the B&Bs where we stayed, and coffee. Black and Bitter espresso, milky latte served in bowls, almond biscotti, and wine. Parfumerie Generale Bois de Copaiba, Cartier Le Baiser du Dragon, and Gloria by Cacharel bring on the cookies and booze memories. Neither the Blond nor I are big drinkers. But we made an exception that trip, curious to taste, smell, and try everything (except for tripe. Never tripe). We drove the country roads of Tuscany, stopped at monasteries and wineries (and monasteries that are wineries). We drank Barolo, Brunello, and enough Chianti to pickle our brains. There were house reds and house whites at every restaurant, many of the hosts in the Agriturismi we visited made their own and used it for cooking, baking, and drinking. We rarely (hardly ever, really) buy Chianti these days, but I always look at the labels and get excited to see familiar names: Greve, Mercantele in val di Pesa (a one piazza town with one alberghino and one pastry shop that made brilliant "lobster tails" filled with vanilla cream), and Rada in Chianti. There were cherry trees laden with fruit at the entrance of the decrepit hotel where we spent our first night on the shore of Lago di Vico (near Viterbo); I'm always reminded of eating those cherries right from the tree whenever I indulge in Guerlain LPRN2 on all its juicy cherriness. But the other fruit that marked that trip was fig. Fresh, ripe, and wonderfully sweet figs from the market every morning, the basket of just picked figs a hotel gardener in Castel Gandolfo brought to me as I was sitting there in the sun, figs in boozy syrup, with a side of honeyed mascarpone... I can't get enough to this day (see my list of favorite fig perfumes and add the very Italian Acqua di Parma Fico di Amalfi). It rained while we were in Florence and we spent a lot of time in museums and cathedrals. Somehow we skipped Santa Maria Novella, even though we were right there in the piazza. Yes, I am kicking myself for all the loves I could have discovered back then. What we didn't miss was the leather market, where I picked two handbags (after trying dozens). Nothing brings me back there as quickly as Tom Ford Tuscan Leather and my recent love: Acqua di Parma Colonia Leather (review coming very soon). That and my rain-soaked hair. The last three days of our honeymoon were spent in Rome. I mentioned above the strike that left the streets bursting with garbage, but we were barely bothered by it. Not even the truly crappy hotel room where I didn't dare step barefoot. The day we arrived there both the Husband and I ran out of reading material (a true horror), so we walked around in the rain to find a bookstore that carried English paperbacks. We bought a copy of Adrian Mole: From Minor to Major which we read every night together in bed until we fell asleep from exhaustion and achy feet. The smell of a slightly damp paperback will always accompany Adrian Mole (and Rome) for me. Maybe Christopher Brosius should get onto it. It was a wonderful trip and the start of a life-long love affair with Italy. The second visit is mostly shrouded in the scent of chestnuts: roasted, in cakes, and as chestnut honey. Our most recent Italian adventure was to Naples and the Amalfi Coast. The plan for next time is to go back to Florence, now able more than ever to appreciate all the fine perfume and artisan wares the city has to offer. Thanks for sharing this! What an ideal way to start a marriage. Italy is so densely full of opportunities for memories and associations - a perfect starting point for layering more and more memories throughout your lives. And love the Adrian Mole series - the first ones really are a fantastic, quirky choice for reading together on a honeymoon (although, have to admit, wouldn't have thought of them immediately, but I should have). Your hair is EPIC! Lovely post. I have a similarily damning cat/dog pics across my history w dh...some things as you say, never change. lovely article. thanks for sharing your happy memories. and may you and the blond make many more together. glad to hear of someone else who talks to and connects with every random cat and dog they encounter. Wonderful memories...thanks for sharing. My 1st & I went to Key West for honeymoon where I bought some lovely frangipani perfume. The 2nd & I just hiked the back 40 and went back to work the next day! Seriously though, THANKS for sharing your beautiful Italian photographs and memories. It's interesting to see how some moments can be so public and yet so intimate at the same time. 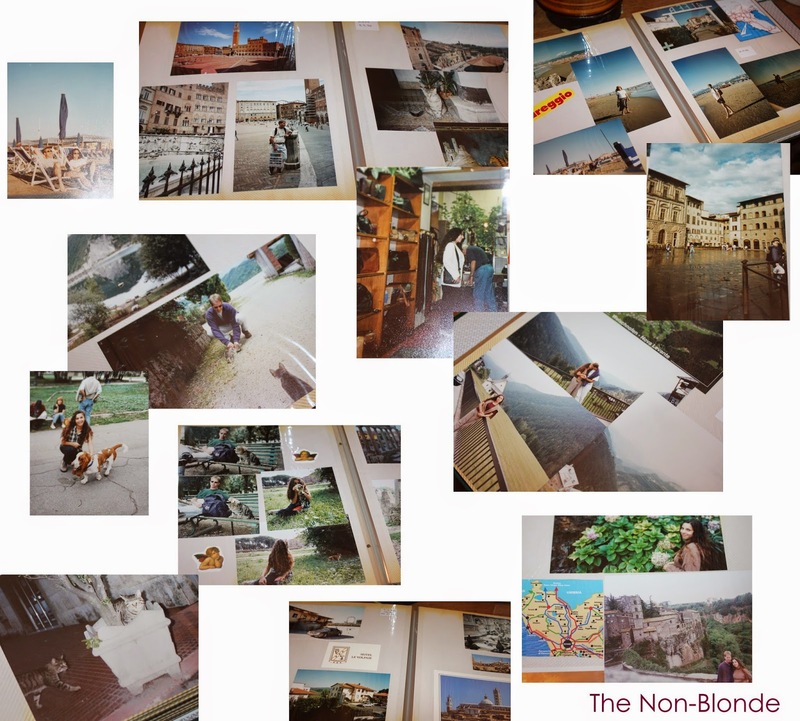 Out and about, enjoying the scenery, you and The Blond are are obviously connecting with all you see and yet there is a special quality to the moments when you are absorbed with each other--it's the classic newly wed glow :-) Thanks for sharing some of your special memories with us. Dear dear Gaia, let me tell you this: I am Italian but live in UK, and every time you write about Italy I instantly feel like I'm there with you, smelling what you smell, eating what you eat, drinking what you drink. Not just because you describe it well, but because you describe it in a way that triggers all my memories. It makes me a bit nostalgic but thank you nonetheless. What wonderfully incredible memories the two of you have! This was so beautifully written I almost feel like I was there!